I finally found a vintage film camera of my very own! It’s not expensive or rare, and I’ll admit, it’s not as impressive a score as the photographer’s beier beirette, but it’s my first vintage film camera and it already has a special place in my heart! 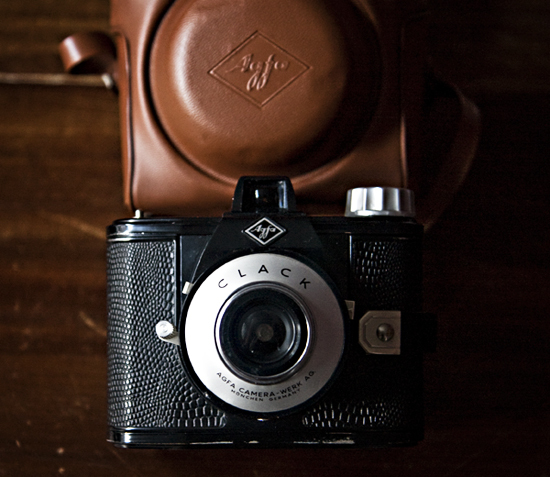 The Agfa Clack was manufactured in Germany between 1954 and 1965 and it’s really nothing fancy, just a medium format box camera that shoots on 120mm film. It has a plastic body, a plastic lens, and only two aperture settings and shutter speeds. Lovely, but a little harsh on the Diana F+, Sage. 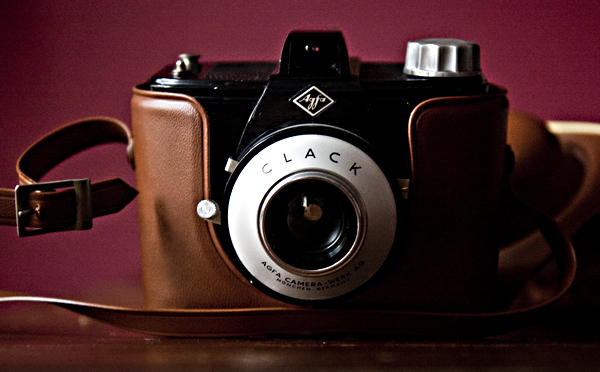 I love the name of the camera…Clack. Perhaps, but having paid $70+ for the Diana, which is completely flimsy (though pretty) next to the Clack, I see the Diana in a new light. I’ve always felt a bit silly carrying it. Oh Sage what a beauty! Now my interest has piqued since showing us all these vintage cameras. I am going to have to keep an eye out at our thrift stores now. You never know what I might find!